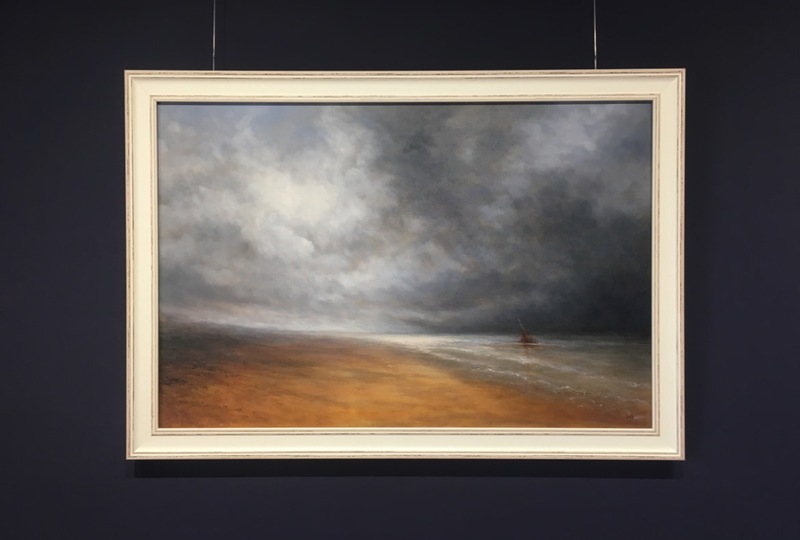 A Unique Three-Part Collection of Norfolk Coastal Skies, painted in Oils on beautiful Irish Linen, by Nial W. Adams. 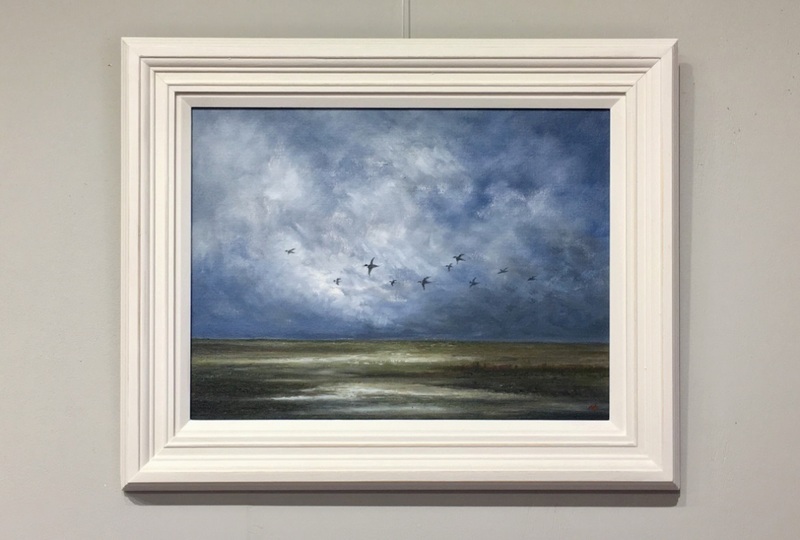 This series of Norfolk Coastal Skies comprises three works; a main Feature Piece, sized at 30″ x 20″, together with two Companion works, both sized at 18″ x 16″. 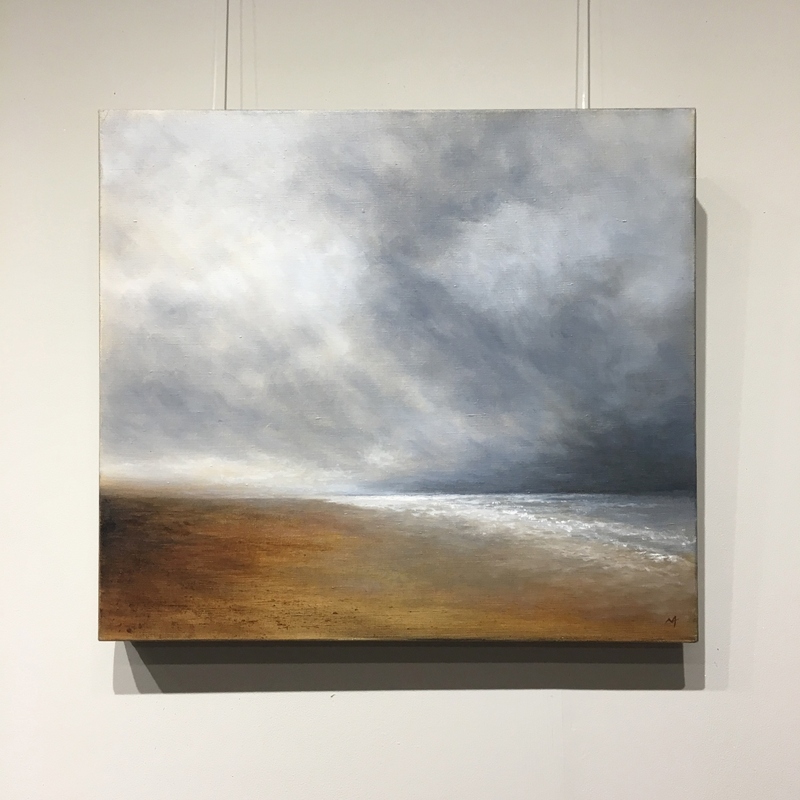 Offered as a set, or available to purchase individually, these original oil paintings represent the wild and dramatic solitude of heavy stormy skies over the North Norfolk coast. 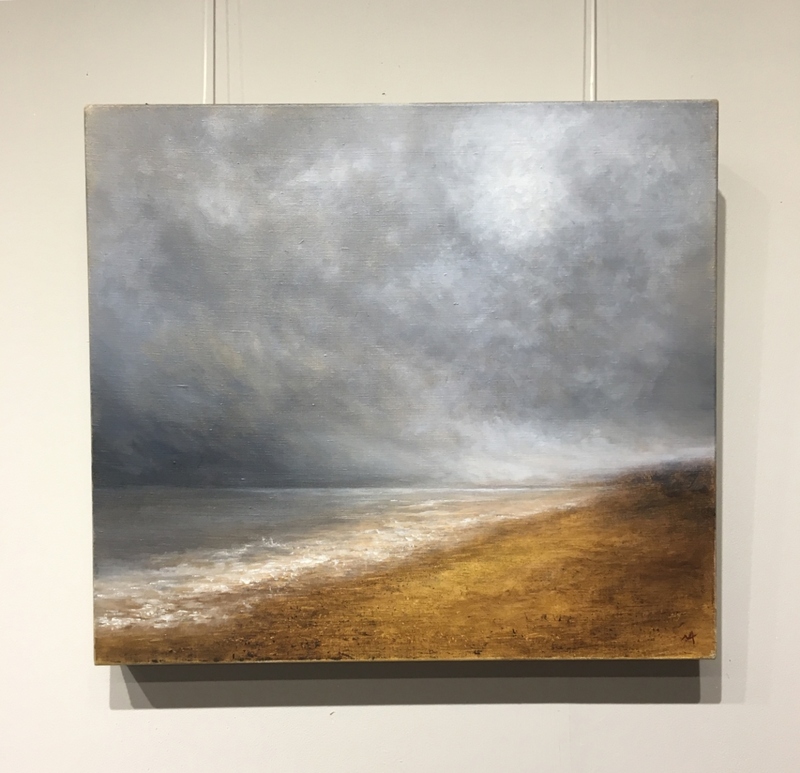 Very much inspired by the works of 19th Century East Anglian Artist Henry Bright, whose use of tonal contrast bring form and depth to his works. Following this tradition Nial has created his own interpretation of this timeless scene. 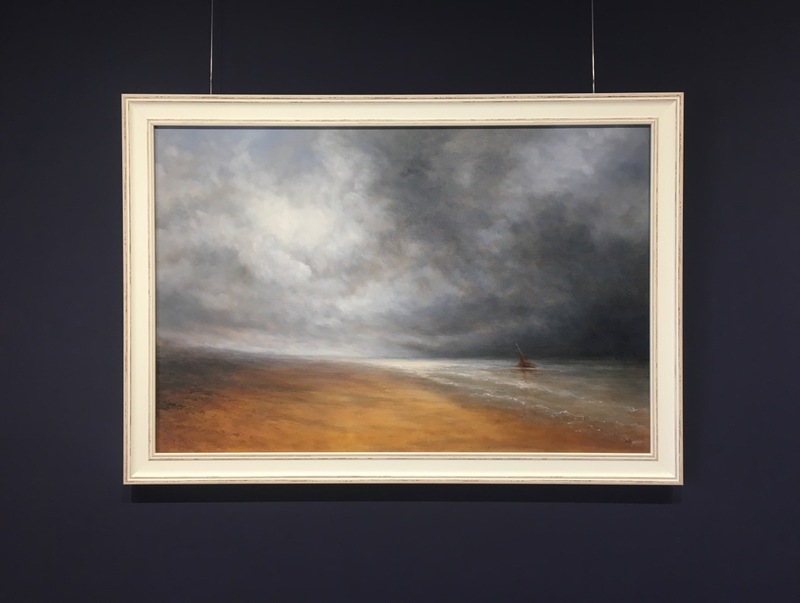 All three works use the same palette of colours, theme and similar perspective of wide open beaches reaching far into the distance, accented by dramatic clouds as the storm passes and light falls on the horizon. 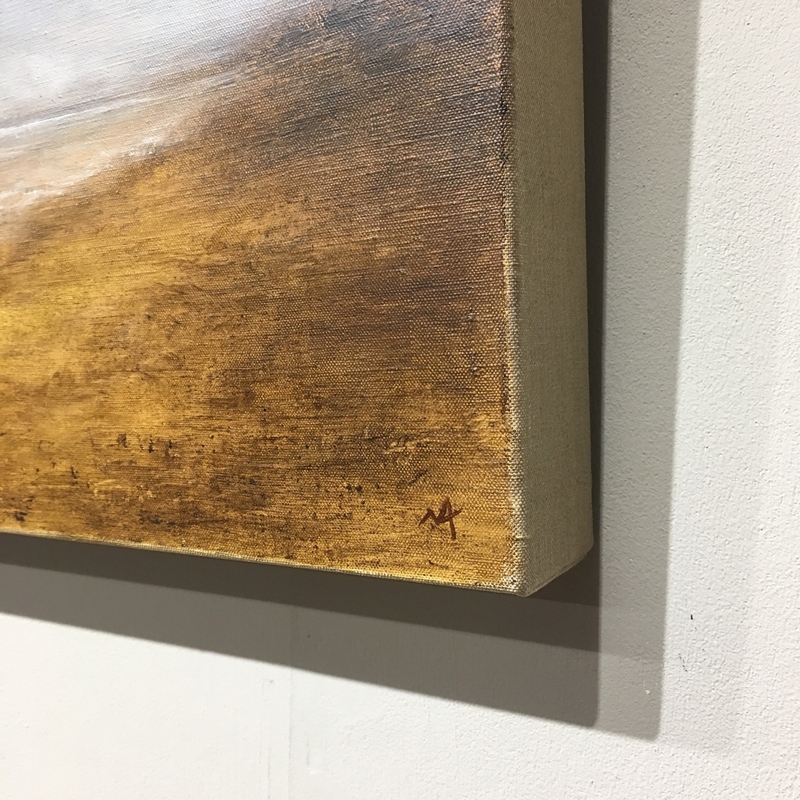 Each artwork has been hand-prepared by the Artist, using his limited stock of vintage Irish Linen (over 60 years old). This superior material is the choice of many top professional artists, being robust and extremely long-lasting. Here below are the details of each piece in this three-part collection, together with pricing and details for reservation. 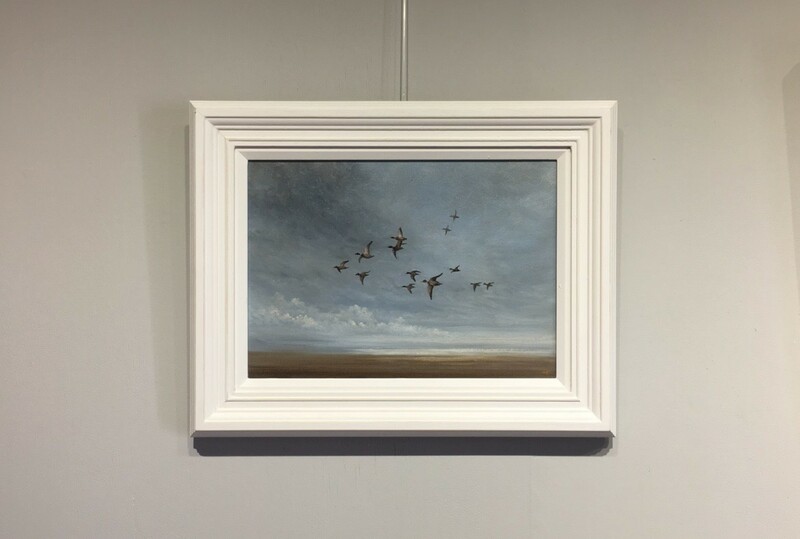 As mentioned above, this piece is presented on Irish Linen, using a standard-edge (depth) stretcher and currently framed in a simple white frame. 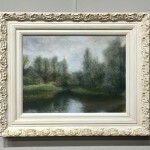 Alternative framing options are available and the Artist can advise on this. 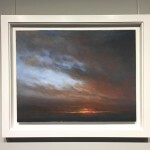 This artwork is presented also on Irish Linen Canvas but with a deep-edge, or gallery-wrap, thus requires no framing. These deep edges have also been left in the natural Linen, showing the material support. 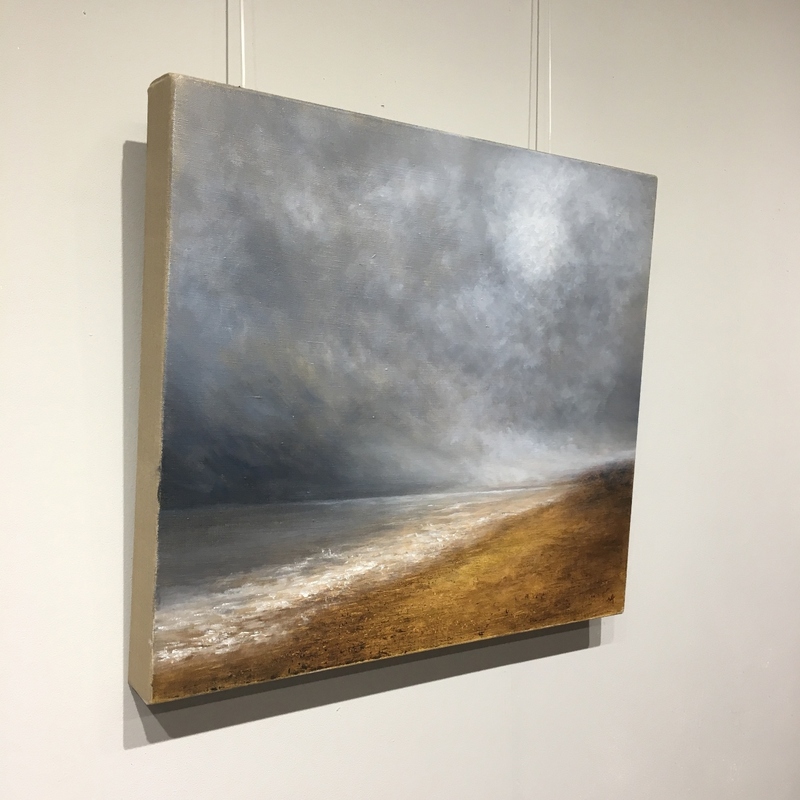 This second companion artwork is again presented on Irish Linen Canvas but with a deep-edge, or gallery-wrap, thus requires no framing. These deep edges have also been left in the natural Linen, showing the material support. If you are interested in acquiring these artworks as a Collection, perhaps for group display as shown in the image below, all three pieces can be purchased as a unique set. All artworks are original, hand-signed and carry our Studio Label on the rear. You will also receive a Bill of Sale confirming the provenance of your artwork(s). Available for order and collection at the Gallery, or by Mail Order (UK only). For Packing and Carriage costs please enquire direct. 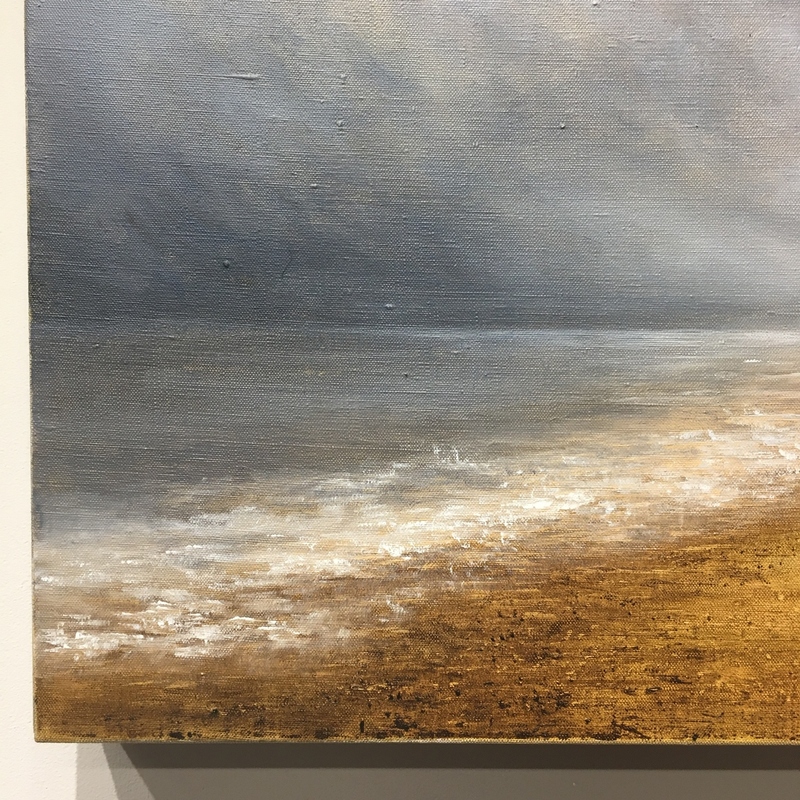 If you are interested in commissioning a similar original artwork, perhaps at a different scale, please contact Nial Adams direct on 01603 755 480, or email [email protected]. Please note; Limited Edition Canvas Prints of these pieces will be available. Full details and options with pricing available on request. 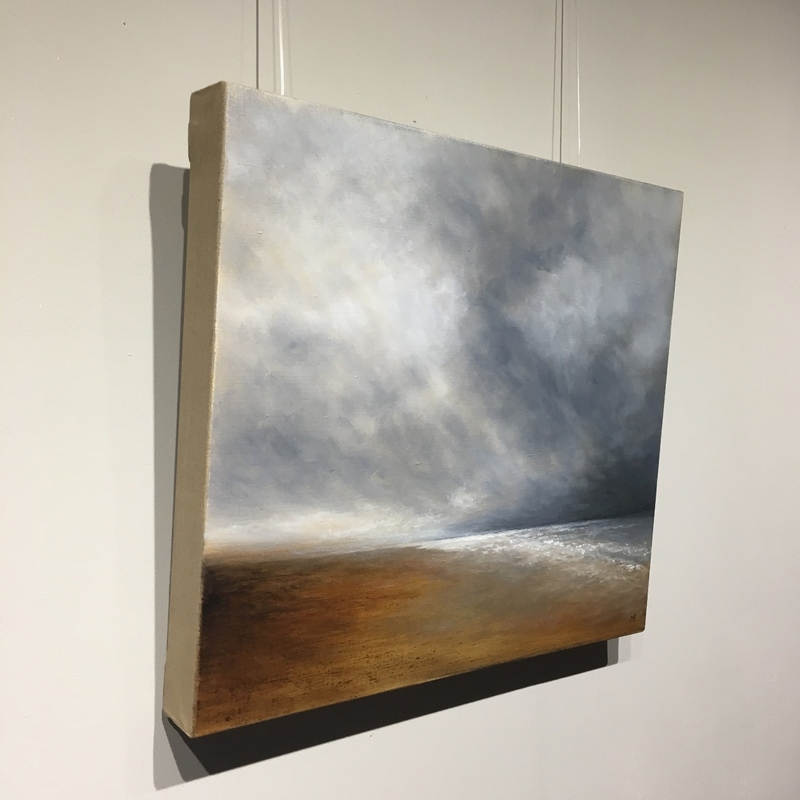 If you’d like to reserve one of these artworks, or the Collection of three, please contact us direct.